The Classic Age of Ancient India roughly corresponded, in the chronology of world history, to that of Ancient Greece – 700 BCE to 350 BCE. It was preceded by the Vedic Age, in which tribal societies of Indo-European origin, dominated by warrior chiefs, had established themselves in northern India. The Classical Age saw the rebirth of urban civilization in ancient India, and with it, a literate culture. It was an age of amazing religious creativity, with the birth of two new religions, Jainism and Buddhism. The latter would go on to become one of the great world religions, influential throughout all the countries of East Asia and of South East Asia. Within the course of later Indian history it would eventually almost die out, though not before profoundly transforming Hinduism, making it the religion it is today. This period of Indian history ended with the rise of the first great imperial state in ancient India, the Mauryan empire, after 320 BCE. 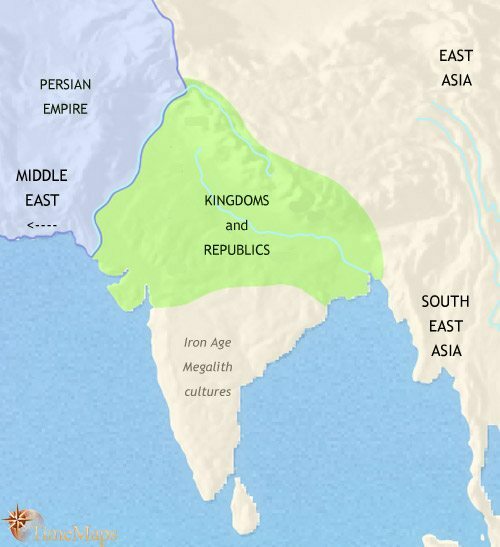 The use of iron spread into present-day Pakistan and northern India after 800 BCE. Iron tools were much more effective for clearing land than were the old stone and wooden tools, and huge tracts of new land were brought into use for productive agriculture. Farming populations previously established around the fringes of the densely forested Ganges plain now moved in to colonize the heart of the river plain. This area, with its well-watered, very fertile farmland would, over the coming centuries, become home to a huge population, and become the heartland of ancient Indian civilization. Villages grew; some became small towns, then larger towns, and then cities, as large as those in contemporary Greece and China. Trade networks gradually extended throughout India, and far beyond. The conquest of the westernmost portions of the Indian subcontinent by the mighty Persian empire must have acted as a major stimulus to trade in that direction, which crossed the mountain passes to central Asia and the Middle East, and ran along the Iranian coast to the Gulf; they also probed outwards across the sea, spanning the Indian Ocean to Arabia and East Africa. To the east, the trade routes went down the coast to the island of Sri Lanka, along the coasts of Burma and Thailand, and on into South East Asia. Metal currency was minted in ancient India during the 5th century BCE, a sure sign of the importance of trade. The expansion of cities and trade led to the introduction (or perhaps re-introduction) of writing into ancient India. A script that came into wide use was based on the Aramaic alphabet which had come into widespread use throughout the Assyrian, Babylonian and Persian empires of the Middle East at this time. This fact is evidence of the growing trade links between India and the Middle East in this period of Indian history. With trade came walled towns and cities, and with towns and cities came organized states. By 500 BCE sixteen large states covered northern and north-central India. Most of these were kingdoms, where centralised authority emanated out from royal palaces, located in the leading new cities of the region. Some of these states, however, were not kingdoms, but were ruled by groups of nobles. Modern scholars have labelled these state “republics”. These tended to be established in the mountainous fringes of the Ganges plain, where, in landscapes of hills and valleys, centralised authority could not prevail against the entrenched power of local clan chiefs. These states were governed by councils of nobles, and formed the only republics to flourish in the ancient world outside the Mediterranean. The traditional Vedic religion was a communal one, well adapted to small-scale tribal societies but less so to the larger, more complex ones that were emerging in ancient India at this period of history. A growing number of merchants, officials and other urban-base people began looking for a more personal religious experience, one which would speak to their individual need for salvation. Moreover, by the 6th century BCE the old religion had become characterised by a high degree of ceremonial. This gave a dominant place to the priests of the Brahmin caste, and some leading members of the evolving society were uncomfortable and felt the need to challenge the Brahmins’ monopoly over spiritual matters. These tensions had a profoundly creative impact on the religious life of ancient India by producing two new religions, Jainism and Buddhism. Jainism was founded by Mahariva (“The Great Hero”, lived c. 540-468 BCE). He emphasised an aspect already present in early Hinduism, non-violence to all living things. The Jains also promoted the renunciation of worldly desires and an ascetic way of life, sometimes to the point of self-torture. Buddhism was founded by Gautama Siddharta, the Buddha (“The Enlightened One”, lived c. 565 to 485 BCE). He came to believe that extreme asceticism was not a fruitful basis for a spiritual life. However, like Jains, Buddhists believed that the release from worldly desires was the way to salvation. In daily life, Buddhists emphasised the importance of ethical behaviour. The emergence of a religious culture in which Hinduism, Jainism and Buddhism emerged as three distinct religions was a development of great importance in world history. Jainism remained a minority religion, practised only in India and never numbering more than a million or so adherents (mainly in urban, merchant communities). Hinduism also remained (until modern times) confined to the sub-continent, and is the dominant faith of a billion Indians today. Buddhism, meanwhile, has spread far and wide outside South Asia. In the course of India’s history it would cease to be a widely-practised faith within India itself, but would have a deep impact upon societies in China, Japan, Korea, Tibet and South East Asia. It is now spreading fast amongst peoples in the West, where by some counts it is the fastest growing religion. The fact that billions of people today practice religions which had their origin in ancient India is not the only significance of this period of Indian civilization. The interaction between three rival but closely related faiths produced a rich and tolerant dialogue between them. Competing speculations about both religious and (what we would call) scientific issues were freely pursued. In time, several centuries after the close of this formative period of Indian civilization, this lively intellectual culture would produce crucially important advances in human thought. For the history of the world at large, the discoveries of mathematical concepts such as zero and decimal places would, when they spread to the Middle East and then Europe, have the most dramatic impact on scientific and technological progress.